Gypsy Vanner Stallion | Marcia Baldwin Figurines | One Price Low Flat Shipping! 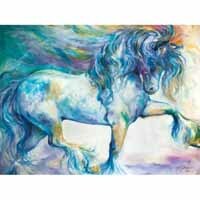 From the Marcia Baldwin Wall Art Collection, Gypsy Vanner Stallion. Comes ready to hang on stretched canvas. Measures 12" x 16". Comes packaged in branded gift box. 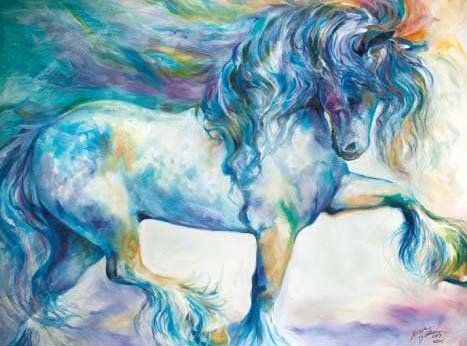 This Marcia Baldwin wall art canvas oil painting features her unique vision of a vanner stallion painted in irridescent tones of swirling blues and greens dramatically contrasting the horse's white body. Specializing in brilliantly colored oil paintings, Marcia Baldwin has known from an early age that art was her true passion. For many years, Marcia worked in and around art, as an advertising designer, art teacher, art consultant, and photographic artisan. Now with her own full-time art studio, she hopes that people can be touched in some way to stop and smell the roses for a moment and reflect on the joy and beauty that each day brings.